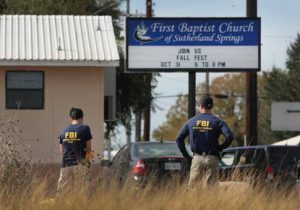 The Air Force repeatedly failed to submit the Sutherland Springs shooter's criminal record to the FBI, allowing the shooter to purchase guns without failing a background check. A report issued by the Department of Defense's Inspector General on Thursday said this was due to a lack of understanding or mistakes on the part of military law enforcement officials. The report described six separate times the criminal records of the shooter, Devin Patrick Kelley, should have been reported to the FBI's Criminal Justice Information Center under DOD policy but weren't. Investigators said these repeated failures led directly to the shooter being able to pass a background check and obtain the firearms he used to commit mass murder before being shot himself by a civilian. "The USAF did not submit Kelley's fingerprints and final disposition report to the FBI at any time," the report said. "If Kelley's fingerprints were submitted to the FBI, he would have been prohibited from purchasing a firearm from a licensed firearms dealer. Because his fingerprints were not submitted to the FBI CJIS Division, Kelley was able to purchase firearms, which he used to kill 26 people at the First Baptist Church of Sutherland Springs on November 5, 2017." The investigators found the same mistakes were repeated over and over again by agents from the Air Force's military justice system. At each point where procedure and policy required agents to report the shooter's records to the FBI for inclusion in the background check system, the agents failed to do so. When the investigators asked why the mistakes were made, the agents told them they didn't understand they were required to submit the records to the FBI. They reported none of the agents could provide them with "a clear, supportable reason or explanation why Kelley's fingerprints were not submitted to the FBI CJIS Division" at each point in the process. When they looked into how the mistakes made it past supervisors, the investigators found that supervisors certified the results of the criminal process against the shooter without actually reviewing them. "Finally, on December 14, 2012, the AFOSI Detachment 225 SAIC and Superintendent did not follow DoD and AFOSI policies for the submission of Kelley's fingerprints and the final disposition report to the FBI CJIS Division even after they received the Report of Result of Trial from Kelley's court-martial," the report said. "Nevertheless, the SAIC certified that Kelley's fingerprints had been submitted to the FBI CJIS Division. We determined that the SAIC and Superintendent did not review the file or properly complete the AFOSI Closed Investigative File checklist and the I2MS checklist. Instead, the SAIC told us that he assumed that the case agent had submitted Kelley’s fingerprints and final disposition to the FBI CJIS Division." The investigators said a combination of inexperienced agents, poor training, poor leadership, and poor oversight caused the mistakes and failures which led to the shooter being able to acquire firearms by passing FBI background checks despite his disqualifying criminal history. A Washington Free Beacon report found evidence failures like the ones described in the DOD report were widespread within the military justice system. A pair of former special agents with the Defense Criminal Investigative Service said the military has failed for decades to share criminal records with the FBI. "It's come back to roost," former special agent Robert Koger told the Free Beacon in the aftermath of the Sutherland Springs shooting. "You don't pay attention and, guess what, now we suffer the consequences." Congress has attempted to address the failures that lead to the Sutherland Springs shooting through legislation. Last year, the Fix NICS bill was signed into law as part of the omnibus federal funding bill. It provides additional funding to help the military, federal agencies, and states submit more of their qualifying criminal and mental health records to the FBI's background check system. It remains to be seen whether or not the funding or other efforts made to improve compliance with criminal reporting requirements will lead to noticeable improvements in the background check system. The DOD report recommended several steps the Air Force should take to improve its own actions. Those recommendations ranged from performing background checks on new recruits to retaining investigative and criminal records for 15 years to reviewing its training for how agents should handle those records. The report also recommended the Air Force "assess the overall performance of the individuals described in this report and implement any administrative, performance, or disciplinary actions, as appropriate." It further encouraged the Air Force to advocate that Congress amend the Gun Control Act "to specifically include commander-issued no contact orders and Military Protective Orders as disqualifiers in determining eligibility to purchase firearms from a Federal Firearms Licensed dealer." Ultimately, the DOD report's conclusion found the entire system's performance to be deficient and directly responsible for the Sutherland Springs shooter being able to acquire the firearms used in his brutal attack. "The investigators and confinement personnel had a duty to know, and should have known, the DoD and USAF fingerprint policies, and should have followed them. The failures had drastic consequences and should not have occurred," the report said. "In sum, we concluded that there was no valid reason for the USAF's failures to submit Kelley's fingerprints and final disposition report to the FBI CJIS Division."